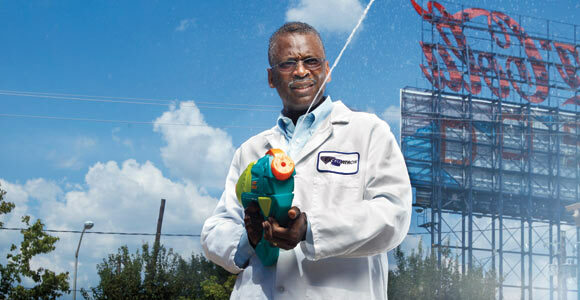 Lonnie George Johnson is an American engineer who is famous for inventing the super soaker squirt gun, one of the most popular children’s toys in the world. He also invented and is now working on perfecting the “Johnson Thermoelectric Energy Converter” which could be a huge advancement towards harnessing solar energy. Johnson was born in 1949 in Alabama. His father was a war veteran and his mother worked at a laundry. Both his parents also worked as cotton pickers on his grandfather’s farm. Johnson was taught to make his own toys as the family couldn’t afford to buy new ones. He was a naturally curious child and often took his siblings toys and other appliances apart to see how they worked. This skill and interest was something that he carried with him throughout his life. Lonnie Johnson was born during the time when blacks still had to live in segregation, so he attended Williamson High School, an all black school. He was a very intelligent student nicknamed “The Professor” by his friends. He aspired to be an inventor but his elders and teachers often discouraged him because they knew that being a black student, he would never get the same rights despite his extraordinary intelligence. They warned him not to hope beyond being a technician but Johnson never gave up on his dream, and took inspiration from the renowned black inventor George Washington Carver. At the age of 19, he enrolled in the 1968 Alabama State Science Fair. This was to take place at the University of Alabama at Tuscaloosa, where five years ago the governor himself had tried to prevent the entry of some black students by barring the doorway. Undeterred, Johnson represented his school at the science fair. His entry was a compressed air powered robot, which he had named “Linex” and had built himself in a whole year with scraps of metal from a junkyard. To everyone’s annoyance and surprise, Johnson’s entry won first prize at the state fair for which he was rewarded $250 and a commemorative plaque. Johnson got a bachelor’s degree in mechanical engineering and a master’s degree in nuclear engineering from Tuskegee University. After this he joined the Air Force where he worked at the Strategic Air Command and helped to develop the stealth bomber program, among other important projects. During this time he also developed an environmentally friendly heat pump that used water instead of Freon. This led to the invention of the super soaker water gun, a toy which has delighted millions of children worldwide. He set up his own business to manufacture and sell the toy but after limited success, he sold it to the Larami Corporation which manufactured and marketed it, making it a bestselling toy. Lonnie Johnson’s company, named “Johnson Research & Development” has invented and patented more than a 100 inventions with mixed degrees of success. His most important project to date, however, has been the “Johnson Thermoelectric Energy Converter” (or JTEC). This is an engine that can convert solar energy into electricity with a much more efficient output than other existing methods. Johnson has had great success so far but if he manages to perfect this technology, he will go down in history as one of the greatest inventors. He has already received many awards and acknowledgement for his work including the Breakthrough Award from Popular Mechanics in 2008, and induction into the State of Alabama Engineering Hall of Fame. He is married to Linda Moore and the couple have four children. He is currently 65 years old and lives with his family in Atlanta, Georgia.